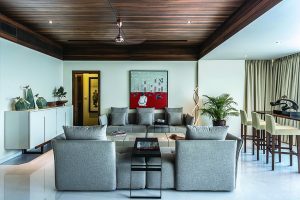 The wooden expanse became the unifying factor for the living room with its two seating islands, one formal, the other informal. 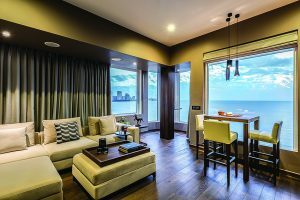 Of course, the architects also capitalized on the apartment’s biggest asset — the sea view — by enlarging windows to floor level. Times change. Society changes. With these come changes in the way, we live our lives. And with changing lifestyles, come changing demands on spaces — especially homes, which are so inextricably linked to our lives. 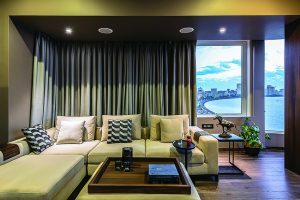 Such transformation was the impetus for this project, which involved the spatial realignment of a 60-year-old apartment in South Mumbai that had seen no changes from the time the owners had taken first possession of it from the builder. 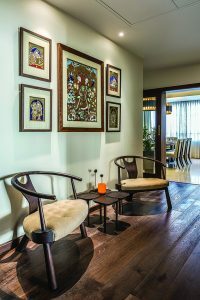 For the family, who reside in Vadodara, this was to become a secondary home, where they could spend moments of leisure and time catching up with friends. 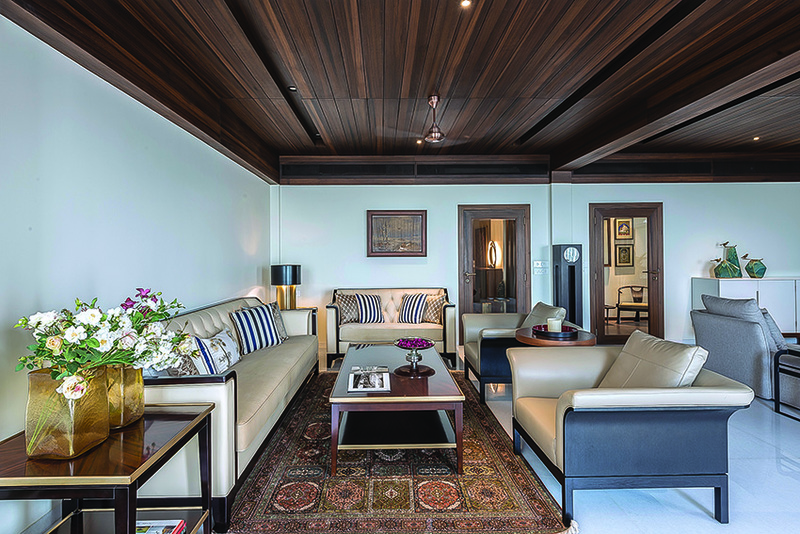 Having decided on white flooring and off-white walls, the architects needed a strong element in the shell to hold the scheme together — therefore the teakwood veneer-clad ceiling. This ceiling treatment also allowed them to camouflage services. Thus, only the glow of the light is visible and not the fixtures; and the AC vents are ‘erased’ from view. 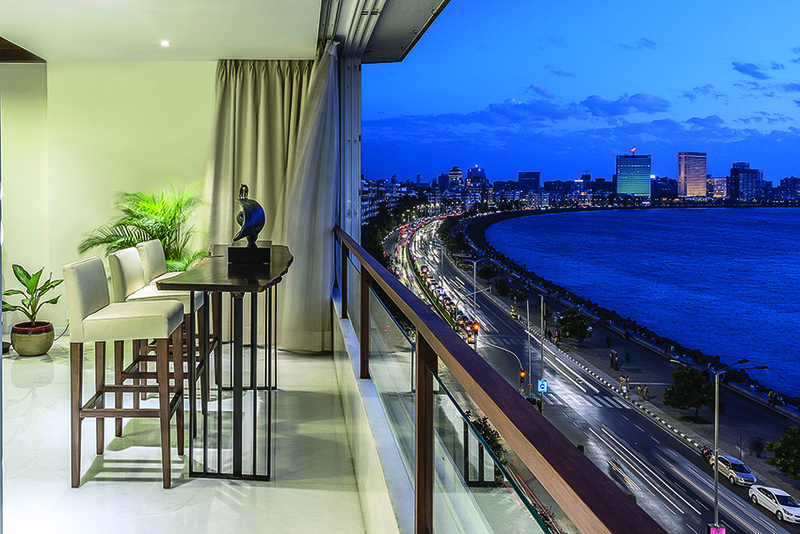 The soothing dining room owes is soft blue colour scheme to the apartment’s littoral location. 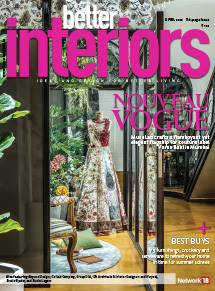 The wallpaper-lined walls and the Krishna painting ‘Kripa Drishti’ by Vadodara-based PranayGoswami resonate the hue. The solid rosewood dining set furthers the refined sophistication. The striking pendants have been soured from abroad. 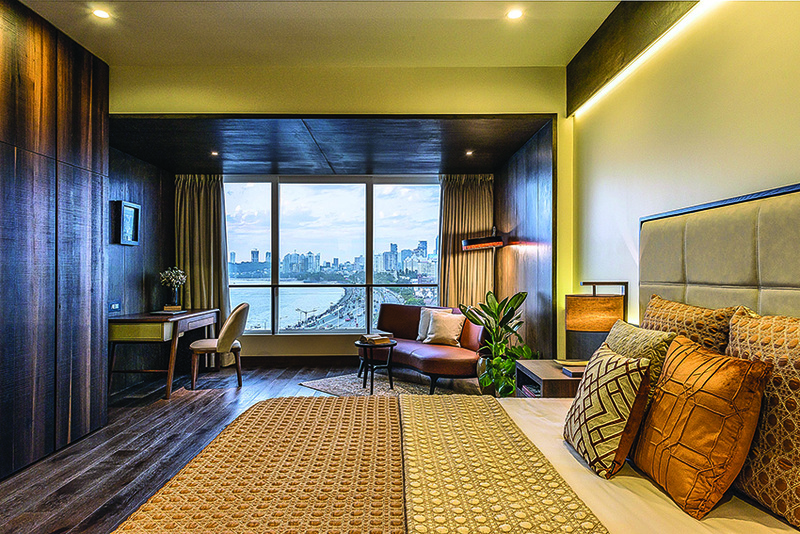 The modern, chic aesthetic was translated as a neutral palette for the public areas, while individual bedrooms were customized to the occupant’s preference. For instance, one daughter wanted a minimal, all-white room with a little dash of colour (blush and grey); while the second daughter wanted rose gold, grey and light grey. Similarly, the son’s room was realized with blue as the dominant colour; and the master room was rendered in neutral shades. While the material palette itself is minimal — engineered wood flooring, polished teakwood veneer and cement sheets for cladding, paint, wallpaper — in order to create a cohesive look, the treatment sees meticulous attention to detail and material play. The mandir, for example, features hand-cut marble jaali frames (customized) from Sompura, while its ‘walls’ are actually handwoven cutwork fabric that has been sandwiched in glass — achieving privacy and lightness on the eye in one design solution. 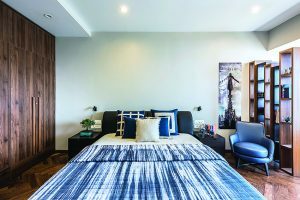 In one of the daughter’s bedrooms, the wall behind the bed is clad in customized wallpaper from London-based companyMuralsWallpapers with a special grunge-paint effect. Cement sheets with a clear coat of Monocoat distinguishes the master bedroom, while all the bathrooms have highlighter Italian marble used as an accent piece in the wall cladding. To create the requisite warmth, lighting throughout the house is effected in yellow lights, with the strategy featuring a combination of ambient, spots and pendants, as per the requirement of the design and space. 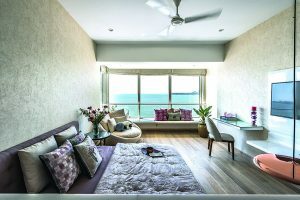 The primary areas of the apartment — the public zone and the bedrooms — are all oriented towards the sea. The master bedroom, a cosy, intimate space, is actually composed of cement sheet-wrapped lounge/study and the sleeping area. 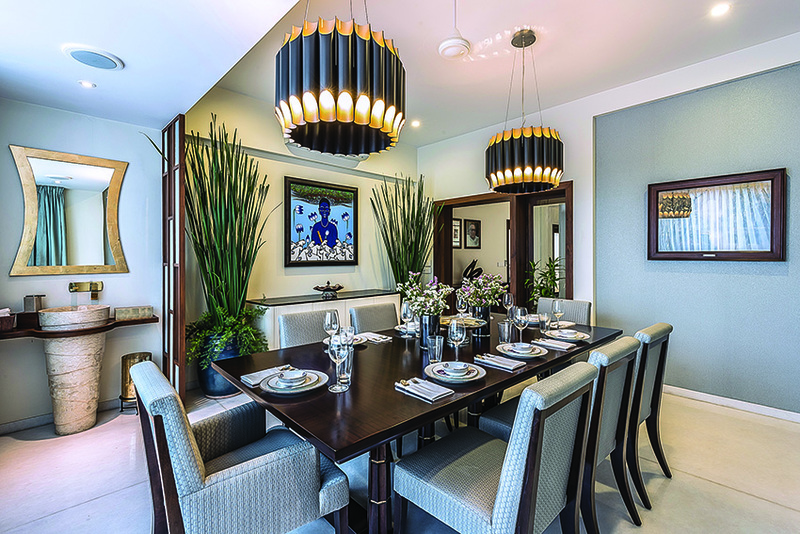 To create a contemporary secondary home equipped to deal with a modern lifestyle. All art for the house has been handpicked. 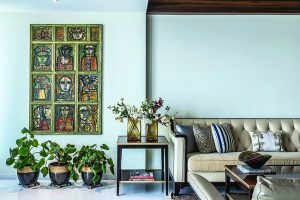 This living room corner is uplifted by a stunning Rini Dhumal. The informal section of the living room. The bar-style seating on the right is an important inclusion, to appreciate the watery vistas. The second daughter’s room. 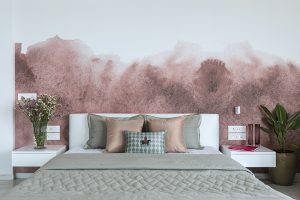 The highlight is a striking customized wallpaper sourced from MuralsWallpaper (London), which takes a stereotypical element of a girl’s bedroom — pink — and reinterprets it in an offbeat manner. The entertainment room of the apartment. The room was made more expansive by enclosing attached balconies — which created tiny intimate alcoves in the process. The structural column, which was ‘exposed’ through the spatial alteration, was encased in wood and fitted with a ledge that comes in handy to keep drinks on. This room is pressed into service when the family hosts smaller gatherings. Larger groups are entertained by throwing open this room and the living room next door. This daughter’s room is the only room with a window seat. The remaining rooms feature sofa or chair seating. The window ledge and a corner bed were both requirements of the occupant of the room. 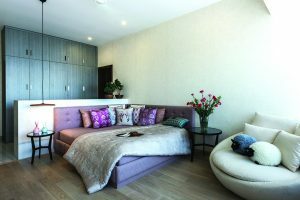 The ‘corner’ was created by positioning a high console near the entrance such that it apportioned the room into a dressing area and a sleeping area. The console also shields the bed from direct view from the door, satisfying the concerns of privacy as well. In the son’s bedroom, the study by the window is segregated from the sleeping area proper by inserting a bookshelf between the two. Besides its primary function, the bookshelf also functions as a perforated scene that allows adequate light into the sleeping area. This vestibule lies at the intersection of the public and private zones. It has been made into an art gallery of sorts to display the family’s stunning inheritance of original Tanjore art.